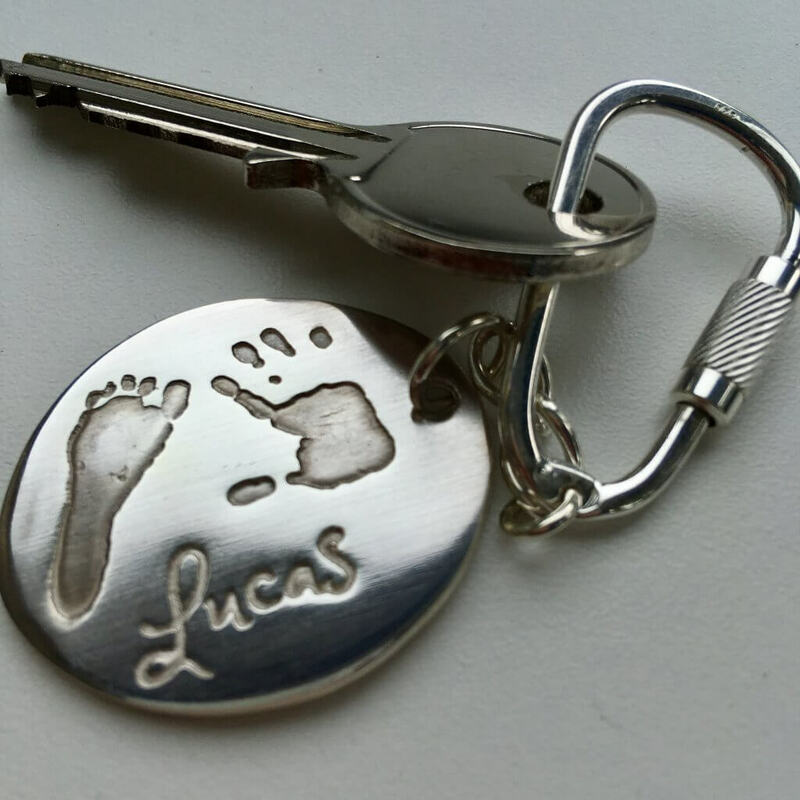 I love personalised items and even more so if they include something precious to me like Lucas’ prints. I recently got a charm and a ring that contains my breastmilk and a lock of Lucas’ hair. Nothing can compare to something that is unique to you or your family. 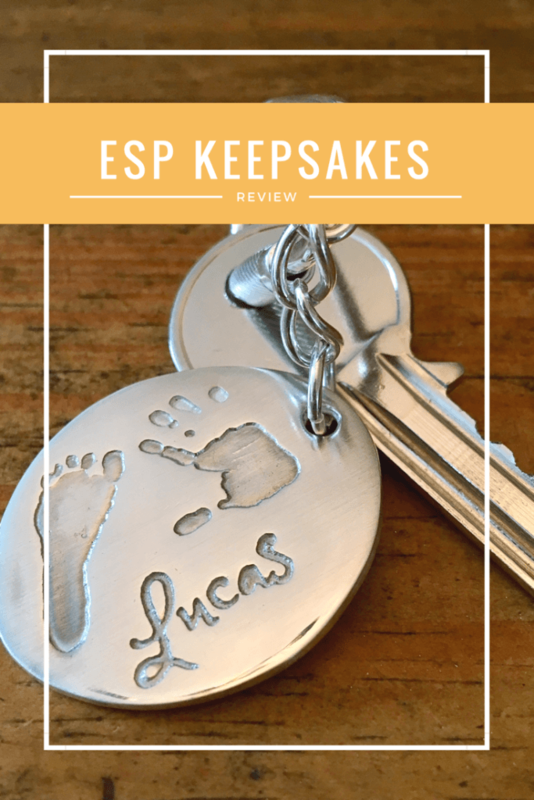 When ESP Keepsakes offered to create me something with Lucas’ prints, I had a nosy through her shop and decided on a keyring. I was sent a mess free print kit which was really easy to use. It contained a wipe and some special paper. You simply use the wipe over the foot or hand then place it on the paper and press down firmly for it to leave to print mark. 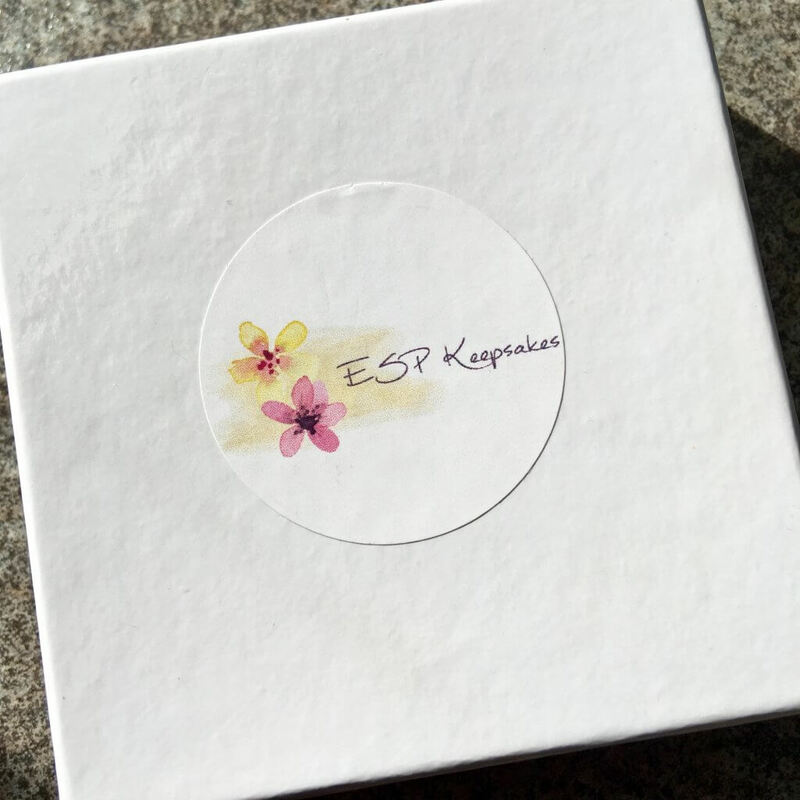 The prints can be any size as they are scaled down to fit the jewellery so they are perfect for using prints from babies to grandparents. The key rings are available in various shapes including round, square, oval and dog tag. They are handmade with silver and finished with a clasp that is easy to pop on your keys and secure once on. The keyring is beautiful, I absolutely love that it fits both a hand and foot print on. I have had it on my car key since getting it a couple of weeks ago and it has got a few scratches on it now but I am not saying that as a negative point but want to point it out as it obviously isn’t going to stay perfect if you use it daily. Silver is a naturally soft metal and I look at scratches as signs of the adventures we have had and shows how loved and lived with it is. I would use a print of my niece’s hand and give it to my sister, her mummy. 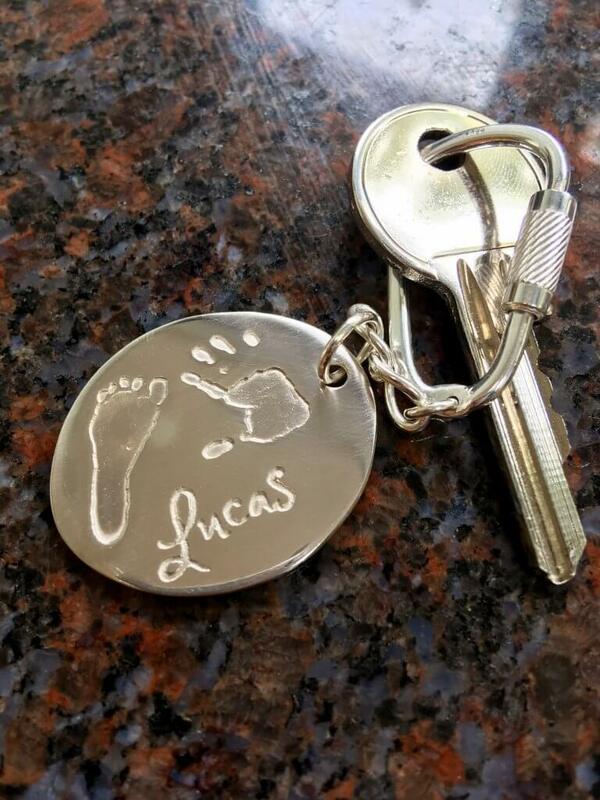 I would get my childrens handprints put on a pendant for the grandparents for xmas, they are always hard to buy for! My youngest, for my parents, who would love it!! My daughter’s who is due in a month! This is so beautiful and unique. My daughters hand print for her wonderful grandad. Whenever we visit as soon as he comes home from work she rushes to him after giving him a huge hug she takes his car keys and lunchbox and puts it away. And when he goes to work in the morning she gives him his keys and luncbox! It’s like a quiet routine they have had for years. So sweet. i would love to have my dog that just pasted away, dog’s print on the key bob. Evie passed away after a year of terminal cancer. I would want my first cat’s paw to be on it as I couldn’t choose just one of the children. I would want my granddog’s paw print. My dog of 13 years has just been diagnosed with terminal cancer and has only a couple of weeks left 🙁 , so I would love to win it with his pawprint on it. A nice family picture we have.